Renewable Energy professionals from Europe and Egypt (and Green Prophet!) 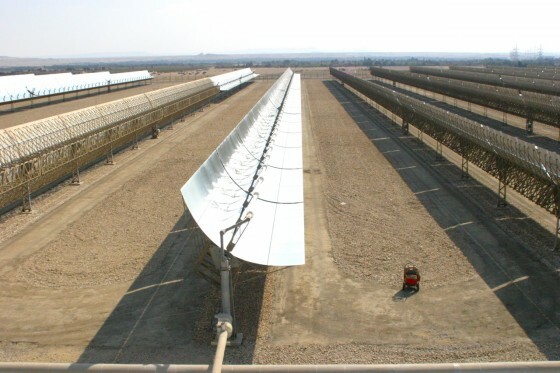 took a field trip to Egypt’s first solar-thermal plant 90km south of Cairo! Brimming with the kind of energy that infuses a school field trip, roughly 80 professionals from the renewable energy industry packed into two large buses outside the Semiramis International Hotel in Cairo last Friday. This was the 3rd and final day of the Desertec conference that addressed many of the concerns related to funding, legislating, and monitoring the push to harness North Africa’s endless renewable energy sources (experts say solar is the future) and eventually ship part of that energy to Europe. The buses were headed for Kuraymat, Egypt’s very first solar-thermal plant located 90km south of Cairo, and Green Prophet was on the scene. Step in for exclusive photographs of this 150 MW Integrated Solar Combined Cycle (ISCC) power plant, which has been feeding energy into the grid since July, 2011. Kuraymat operates at night as a combined cycle gas power plant producing roughly 110 MW of natural gas-fueled energy. 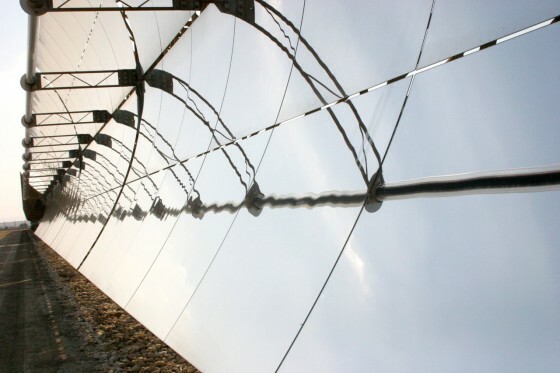 During the day a 1,900 square meter solar thermal field filled with parabolic trough technology converts energy captured from the sun into steam-powered electricity. 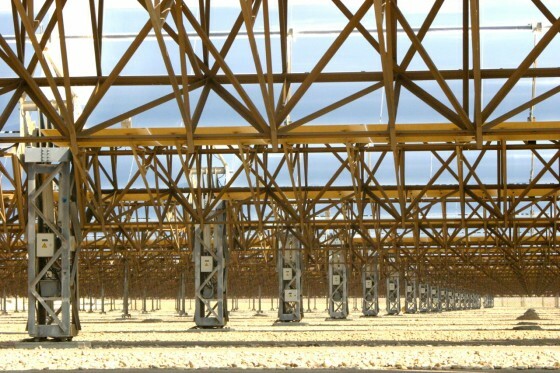 The solar field has a capacity of 150 MW during peak hours. 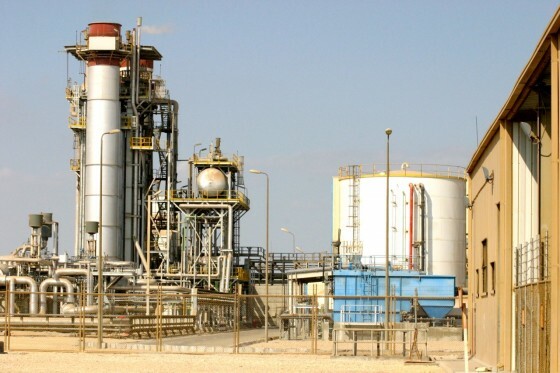 Although the NREA relied on international help to lift this project off the ground, including a $50 million grant from the World Bank and a $190 million loan from the Japan International Cooperation Agency (JICA), the Egyptian contractor that oversees the daily management of the plant predicts that this project will pave the way to a more independent renewable future for the country. Sherif Sharobeem, the Deputy Manager of Orascom’s Business Development Department told Green Prophet that if the relevant government agencies are willing to do their part, within the next five years, it is possible that Egypt will be able to manufacture their own solar components. As it stands, however, Flagsol GmbH – a subsidiary of Solar Millennium AG – delivered the bulk of the program’s solar technology. However, 100% of the steel used was provided by Egypt’s own National Steel Fabrication Company. 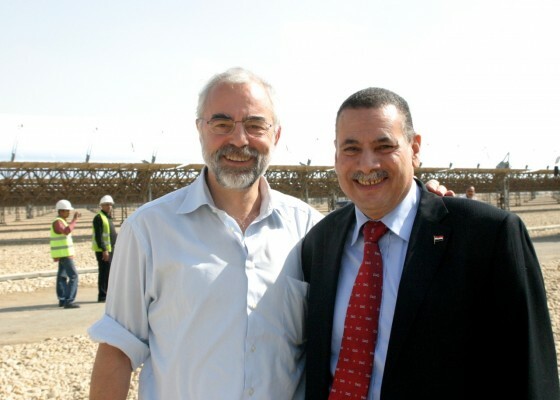 Paul van Son, CEO at Dii GmbH, and Mahmoud Attia Mustafa, Vice Chairman of Egypt’s New and Renewable Energy Authority (NREA) pose for a quick shot at the Kuraymat Solar-Thermal plant south of Cairo. 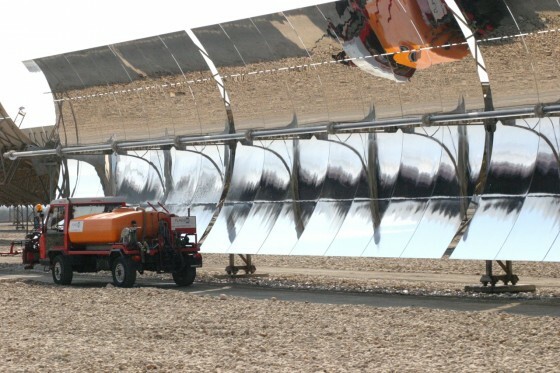 Technically the Kuraymat plant is not part of the Desertec program since its initiation preceded the vision to tap into the MENA region’s renewable resources to provide 15% of Europe’s electricity by 2050 (the 500MW solar power plant in Morocco slated to begin construction in 2012 is Desertec’s official pilot project.) However, Andreas Wischnat, an Analyst Strategist with Dii pointed out that “Dii is an enabler” that brings together stakeholders. As such, Kuraymat may be one project in a chain that could ultimately contribute to the mutual visions of countries from the Middle East and Europe. 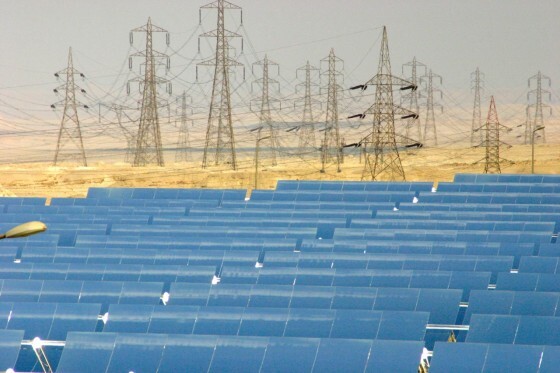 One thing is for certain, if local governments in Algeria, Egypt, Morocco, Tunisia and other Mediterranean countries continue to pursue renewable energy programs with such determination and focus, given the region’s vast resources – (capturing a mere 0.3% of the light falling on the Sahara and Middle East could power the entirety of Europe, according to the European Institute for Energy’s Amulf Jaeger-Walden, reported by Treehugger) – within the next few decades, we could see a serious shift away from oil-producing countries in the world’s energy politics. Previous Previous post: Urban Open Spaces: Good or Bad for the Environment? There was a mistake in the numbers in this article. we are willing to invest solar CSP or pv or wind type …to produce electricity in our desert ,please try to guide us or introduce a well known German company who is willing to handle this big projects for us . Assalamu alaika warahmatullahi wabarakatuh my dear brother in islam. I am a German muslim and I want to make a business with solar panels. I am student (Business Administration) and searching for a partner to start this project. I already collected the needed information but am searching for a hard-working and trusted partner. If you are interessted you can e-mail me. There seems to be a typing mistake, 1,900 sq meters to produce 190 mw during peak hours sounds too little of an area! Kindly clarify. A most informative piece of reporting. Bravo! It is a sobering thought that if our political system were not as complex as it is, this technology that is now springing up all over the world – but which was developed in Israel back in the 1980s – could have been feeding electricity into our grid for the past 3 decades. Instead we are still only talking about “Ashalim” and importing Chinese PV panels that are heavily subsidized by our tax money and which contribute almost nothing to our national electricity requirements.